I don’t know about you but chores are something I have a hard time keeping up with between the two of my kiddos. Even more so now that school is out. Mainly because up until now they have had shared responsibilities. They would take turns loading and unloading the dishes…and then argue about who did it last (really). In the last few weeks I have decided that my 9-year-old is probably old enough to start doing larger tasks. She has been begging to help with laundry for a while but I have a certain way things are hung and folded so up until now I haven’t wanted to relinquish that to her. That is, until school let out and there were more dishes…more unloading and loading….and more arguing….and this Mama was over that pretty quick! I knew that it was time that they stop sharing the dishes, but I also needed to solve the issue of keeping up with what they did/didn’t do. I needed a visual reminder for them as well as myself. Off to the wonderful world of Pinterest I went! Sure enough after a few minutes of looking I had found exactly what I was looking for! 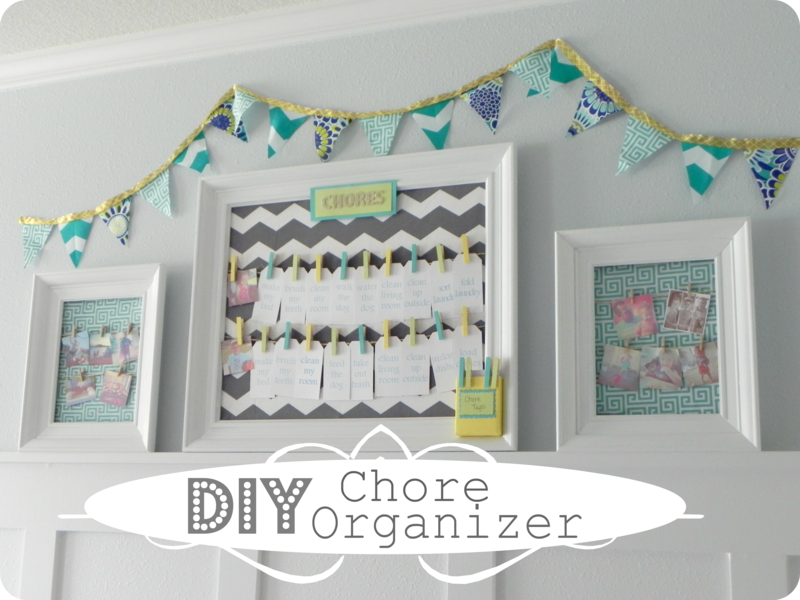 She has a great tutorial on how she made her children’s chore chart! 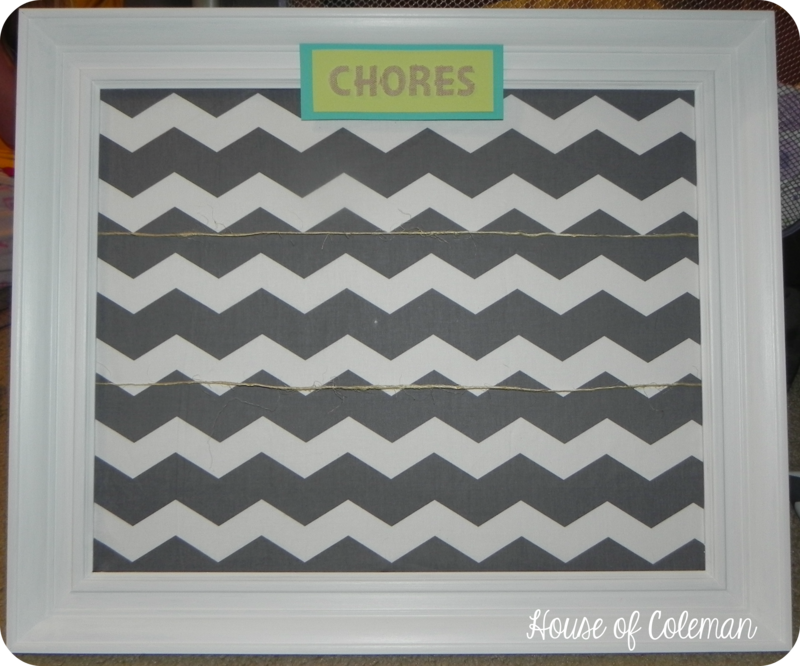 As soon as I laid eyes on her chore chart I knew that I needed to have one! I headed off to Hobby Lobby and found the fabric I wanted to use. 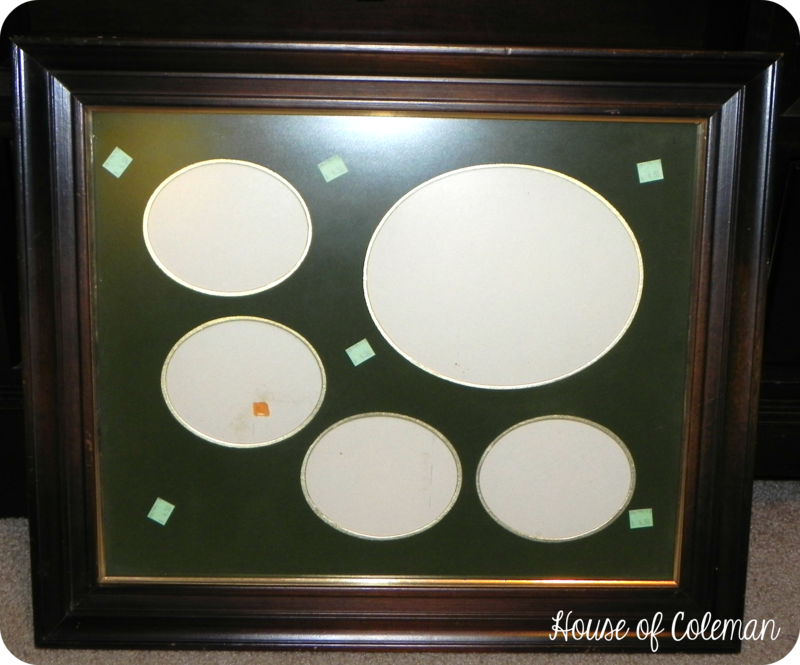 I also made a stop at my local Goodwill and scored BIG with a large frame for $4.50!! (And a few days ago they had a 50% off sale and I rushed back over and was able to pick up 2 matching smaller frames (I turned them into Instagram Picture Frames! Check back in a few days for my tutorial on how to make them!) for .75 each!!) Love a good deal! Once I got it home it was time to get to work! I took my large frame apart and gave it a good scrub down to get all the dirt/dust off and started painting it white. I didn’t have any spray paint on hand but I would recommend it. I just used some white paint I had left over from my Kitchen Makeover. It worked just as well I think (this picture is just of the first coat, after another coat the brown was covered up completely). And then I followed her tutorial for the next few steps. The bones of my chart are the same as hers but I needed to add color to mine. 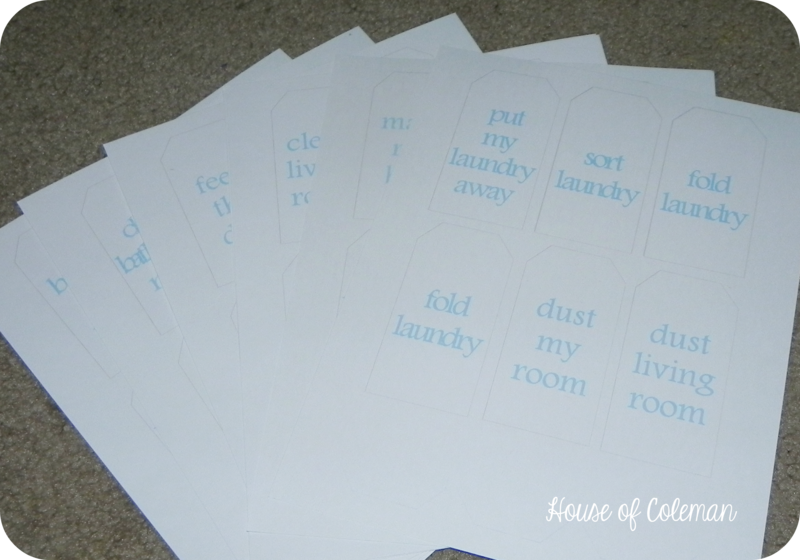 So I took two pieces of scrapbook paper and some stickers I picked up at Hobby Lobby, they look like they are made with burlap, and cut two rectangular pieces out, hot glued them together and added the word “Chores” to it. I simply hot glued it to the frame. I also wanted my clothes pins to be more colorful. I didn’t really want to paint them so I decided I would add scrapbook paper to the front for a simple fix. 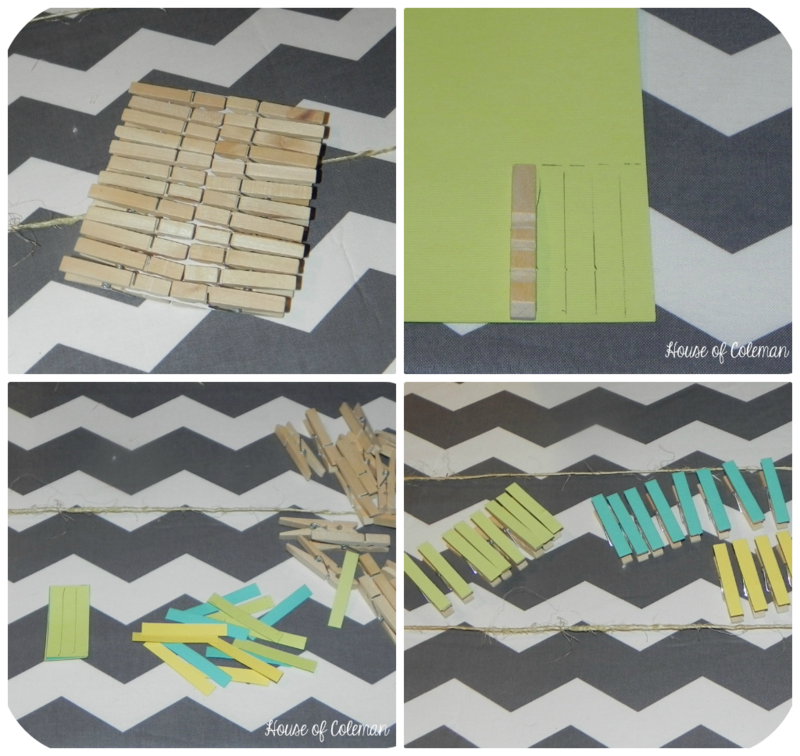 So I took the small-clothes pins (purchased at Hobby Lobby) and traced them onto the scrapbook paper. Cut them out and hot glued the paper to one side of the clothes pin. Once I had them all cut out I quickly realized I needed somewhere for the extra tags to sit while they weren’t in use. While looking in the spice cabinet I found a small box that was the perfect size for what I needed. 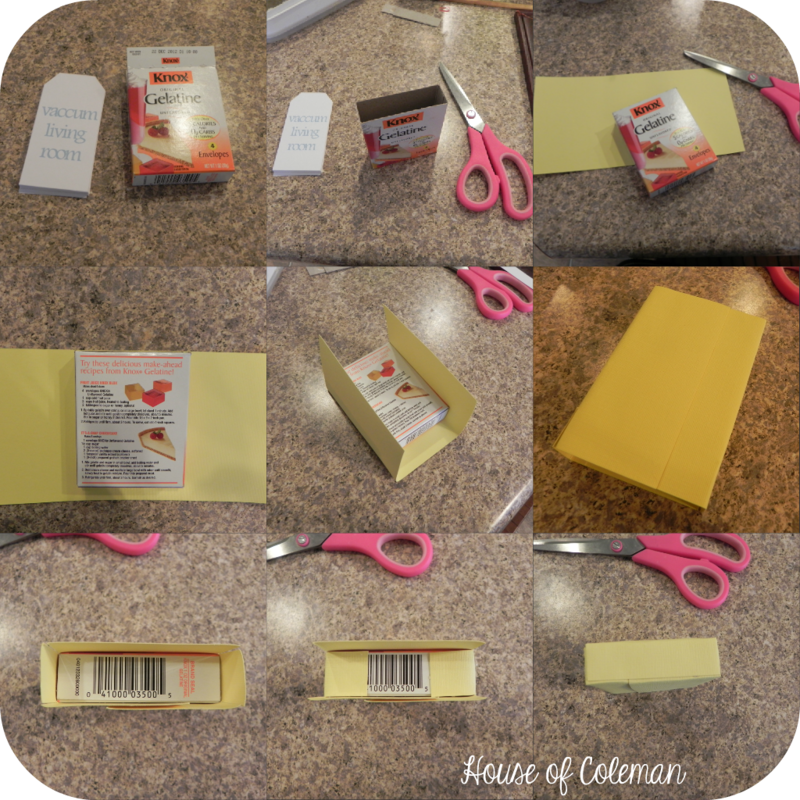 I cut the top openings off where they folded and then covered the box with yellow scrapbook paper. I just hot glued the paper on over the box. I’ve never covered a box with paper before but that was super easy and fun! After the box was covered the yellow kind of stuck out too much. So I took the blue and green scrapbook paper and cut out two small squares, one smaller than the other, with decorative scissors and hot glued them together. 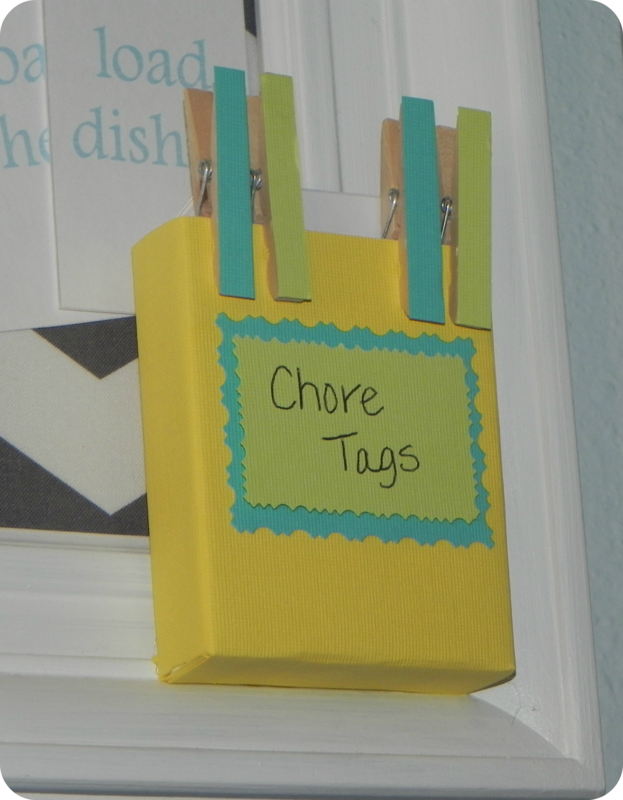 Hand wrote “Chore Tags” on it and hot glued it to the box! Simple, Easy and Cute! It even holds the extra clothes pins! I simply hot glued the box to the frame. My Chore Organizer wasn’t quite complete without a few pictures! I printed out two pictures from my Instagram feed, one of each of the kiddos and pinned them onto their chore line. I absolutely love how it turned out! Now my kiddos and I have a reminder for what’s to be expected of them and when! I catch myself looking at it all the time! 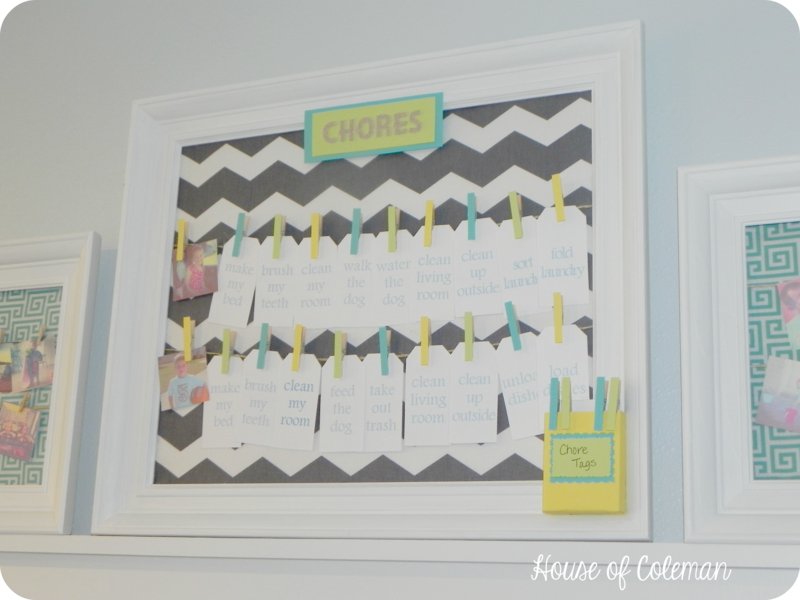 And since it’s been hung up the kids have really been interested to see what chores they have each day and making sure that they get them accomplished before they go to bed! It’s a win win for all of us! 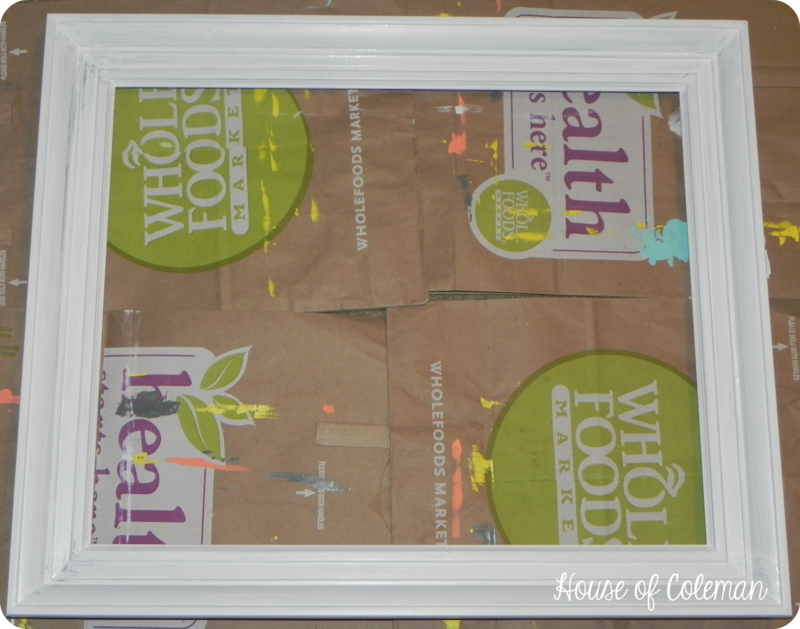 Check back in a few days, I’ll have a tutorial on how to make the Matching Instagram Picture Frames! !